During the Oor Wullie Bucket Challenge over the summer many folk have admired the "Life Boatman Wullie" down at the pier as part of the Oor Wullie Bucket Trail. All 70 of the braw statues have now been withdrawn from their various locations and are coming up for auction. 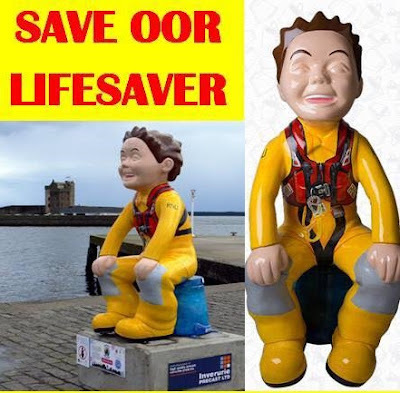 In response, a save Oor Lifesaver Wullie campaign has begun in The Ferry with a JustGiving crowd funding page being set up by Ewan Philp who is both one of the Broughty Ferry Lifeboat Crew as well as a very active member of Broughty Ferry Traders' Association. Hopefully, the crowd funding will provide the cash to successfully bid for the "Life Boatman Wullie" when it comes up for auction on Tuesday 13th September at the Dundee Rep. All of the money raised to pay for the sculpture will go to The ARCHIE Foundation’s Tayside Children’s Hospital Appeal. Any surplus funds will be split evenly between The ARCHIE Foundation and the RNLI. So far £5,292 has been raised, which is just over half the target. Please help to raise tthe remainder by next Tuesday.